I don’t watch a lot of TV, but I admit: I really like the show Undercover Boss. It profiles how out of touch executives can be with their own employees, and how important it is for workers to feel connected to management. On a recent episode, two employees in a large Southern US warehouse facility complained of working conditions and the heat levels they were exposed to daily. One employee filled boxes with merchandise, and the other put those boxes into semi-trucks for shipping. Both areas were poorly ventilated. To add to their frustration, the company had sport drinks in plain sight of employees, but kept them locked up only for “special occasions” or “excessive” heat. Routine physical training, since fitness plays a part in how well a person tolerates heat. Pulse, blood pressure, temperature, and weight measurements after major events, to make sure they’re recovering properly from extreme heat exposure. Work/rest regimens: A local rescue team told us they use a two air-tank maximum during fires. If a firefighter is in a respirator long enough to use two tanks of air, they’re required to leave the action and rest. We can all appreciate the care and training emergency rescue teams go through to protect their workers, but what about construction workers who are outside in extreme heat during the summer, school and community outdoor summer sports programs, people in confined spaces with inadequate ventilation, or those two workers in the warehouse from that episode of Undercover Boss? A lesson we’ve learned from our firefighter customers is that the first lesson is to know the points at which heat-related illnesses occur. Awareness and worker education will play a large part in reducing workplace heat-related illnesses. The information is available for coaches, race coordinators, and warehouse managers to better gauge the necessity of rest periods and other protective measures (ventilation control changes) during extreme heat conditions. 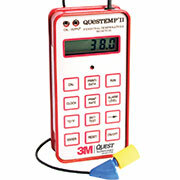 3M QuestTemp products are designed to provide the data to monitor these situations and take action based on their readings. This chart, from OSHA’s website, provides a basic guideline for risk levels and protective measures. Click the links for OSHA recommendations for worker health and safety in high temperature environments. 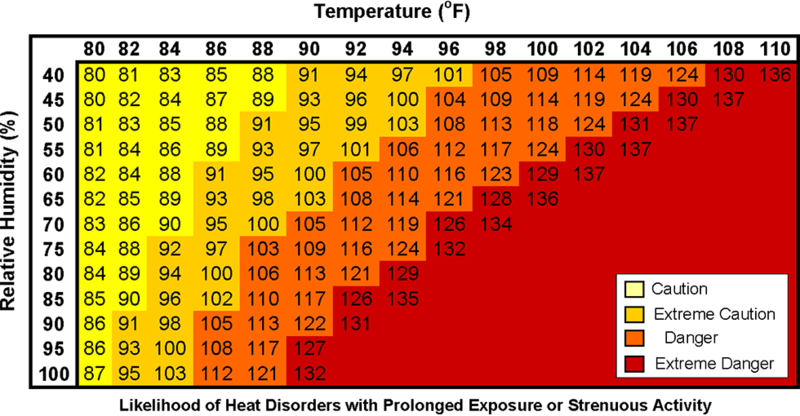 The US National Oceanic and Atmospheric Administration’s (NOAA) National Weather Service produced this heat index chart, so you can take into account both temperature and humidity in determining what heat-stress precautions are necessary in your daily operations. If you want to learn more, read about heat stress prevention and work-rest regimens with these three articles.